A therapy dog used to help patients going through cancer treatment has a poignant twist to his tale after he had seven months of chemotherapy himself. 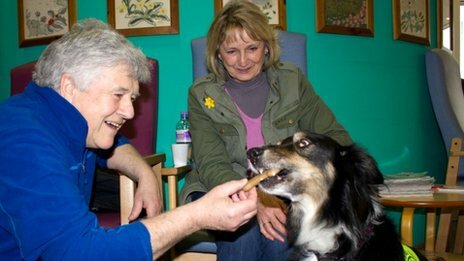 Charlie, a Border collie, makes weekly visits to the North Wales Cancer Centre at Ysbyty Glan Clwyd as part of the Pets As Therapy (PAT) scheme. His owner Jane Howatson said patients were able to empathise with him when they heard his story. Charlie was diagnosed with cancer of the lymph nodes in August 2012. 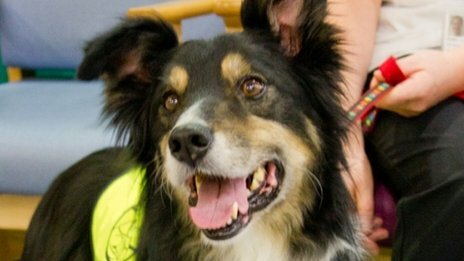 He is one of 41 PAT dogs and one cat who work across north Wales as therapy for humans visiting hospitals, hospices, homes and schools. Ms Howatson, from Llansannan, said: “Happily Charlie is in remission at present, he loves coming here to meet the patients and they enjoy seeing him too. “He comes here and you can see he is concentrating all the time, working in his own little way when he sees the patients. “When patients stroke Charlie and find out what he has been through, you do see a sense of empathy from both. “We come here every Thursday and it’s nice as Charlie gets to see the same people who are going through regular treatment and it’s nice for him and them to get familiar with each other. Charlie has been adopted as the honorary mascot for the centre’s staff.